Other than symbols that can pay profitable prizes, other tempting features this game hides are its extras. Play the base game and you can boost any prize you win with a special gamble function but line up some special symbols and you can also get some free spins bonuses and expanding wilds. And the best part is that you can bank these prizes whether you’re using a mobile or a laptop to play. If you’ve never played slots before, don’t worry. Lagertha is simple to set up and play. To start, just choose how many paylines you want to activate with the buttons on your left and then choose the size of your payline stake on your right. With only 1 payline active and the lowest payline bet, you can play for as cheap as 0.02 credits for a round. But with all bet controls set to the max, your stake will end up at a big 100 credits per spin. You can win cash prizes with six base symbols in the Lagertha slot machine and two special icons that trigger bonus features as well. To determine which paylines you want active, you can hover over the numbers sitting next to the reels and the slot will highlight each individual payline for you. The biggest payout you can hit when you play for real money is 5,000x your payline bet for a five-symbol combo while the smallest returns are set at 10x your line bet for three matching symbols. But what you get with this game that you won’t get in many other slots online is the gamble function, which can take any payout you make and double it up multiple times. For players who prefer playing on the go, Lagertha also comes in a mobile-optimized package. Like all Fugaso slots, this game is compatible with Android tablets and smartphones but also iPhones and iPads. To start playing on your device, first switch to landscape mode and then tap the screen once. The slot will load instantly and give you big touch buttons you can use to enjoy this game seamlessly. The only way you can trigger a prize while playing Lagertha by Fugaso is by lining up three or more identical symbols on an active payline from left to right. For big profits, you’ll need some of the Lagertha symbols which also serve as the wild icons in the game. Like all wild symbols, these icons can stand in for any symbol except the scatter to complete the highest payouts possible. But when they form a matching combination without substituting, they can also pay up to 1,000x your line bet when playing for real cash. Even more rewarding are the scatter symbols, which look like a Viking longship. If three or more of these symbols land in any position, they can pay the biggest payouts in the game but also trigger 10 free spins. The free spins are played with a special expanding wild symbol which can grow over an entire reel to trigger bigger prizes and they can also be re-triggered with at least three new scatter symbols. And even more extra money can be won in Lagertha with the game’s progressive jackpot prize and the built-in gamble feature. The gamble feature can be used after each payout by pressing the “Gamble” button on your screen. This feature will let you guess the colour of the next card to double your money or lose it if you guess wrong. As for the jackpot, it is split into three levels of prizes, each of which can be won during any round. 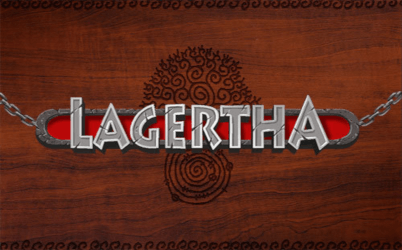 Thanks to its active paylines and a wide range of features, Lagertha can appeal to many player types, especially those looking for affordable slot games. If you’re after medium-variance slots that can entertain and pay well, Lagertha is worth putting on your list. This slot has a well-balanced hit ratio that can produce plenty of smaller prizes that’ll keep your budget in check as you chase away after bigger payouts. There are prizes of up to 80,000x your line bet to be enjoyed at the game when playing at a real money casino along with progressive jackpots and free spins bonus games. However, with the game paying frequently, hitting a max jackpot could be hard. Therefore, if you prefer slots that are known for paying big prizes, you might also want to play some of the high-volatility games from the studio like The Mummy 2018 or Carousel. The Mummy 2018 is particularly enticing, offering an attractive presentation, cluster pay mechanics, bonus re-spins, and other exciting extras. For a simpler playing experience, however, you can try the Carousel instead, which likewise features three jackpots and free spins bonus games. To try both games but also other stunning online slots from the software studio, you can take a look at some of the top casino operators we’ve reviewed personally on our website.